The Campo was paved with bricks and cobblestones in the 14th century, and is divided into nine strips or units that represent the government of the Nine, the magistrates who brought the city to its greatest period of prosperity in the early to mid 1300s. Unforgettable at the top of the square is the majestic Fonte Gaia or Fountain of Joy by Jacopo della Quercia, whose elegant sculptured reliefs celebrate the arrival of water into the medieval town. 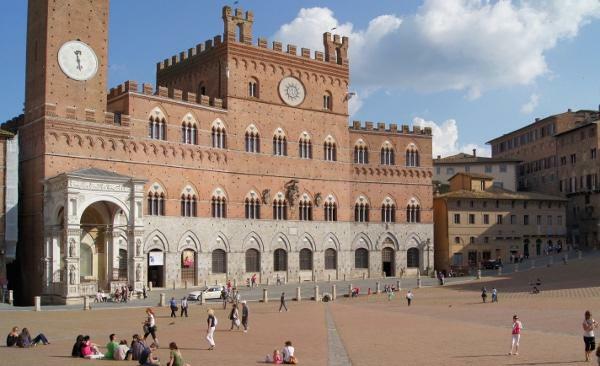 The Campo is still the “living room” of Siena, the city's pulsing heart where one goes to meet friends, to sit and share gossip, to drink an aperitif, to listen to strolling musicians, to people-watch and of course, to witness the excitement and spectacle of the Palio.